The PrayFit Diet was created by exercise physiologist and New York Times bestselling author, Jimmy Peña. He is also a celebrity trainer whose clients have included LL Cool J, Tyler Perry and Mario Lopez. Peña says his highest calling is to help people transform their bodies and souls through his unique approach to fitness. He believes that faith is a powerful tool for overcoming any obstacle, including your health. On this program you can lose up to twenty pounds in thirty-three days. The PrayFit Diet combines spiritual motivation with a perfectly portioned meal plan to help you achieve your goals. This macronutrient balance can increase energy levels, decrease inflammation, improve cholesterol and blood pressure, and promote healthy blood sugar levels. PrayFit includes a 33-day meal plan, which provides between 1500-1700 calories per day. Clean and lean sources of protein promote fat-burning, muscle repair, and keep you feeling full for longer. Monounsaturated fats found in olive oil, avocado, and peanut butter can reduce your cholesterol levels. Polyunsaturated fats such as in salmon, walnuts and sunflower seeds improve cardiovascular health, reduce cancer risk, and enhance fat-burning. PrayFit emphasizes food should fuel your life, not rule your life. Faith can be a powerful tool for overcoming obstacles, which includes your health and weight loss challenges. The book’s goal is to help everyone see improving their health as a way to serve their community, family and most importantly, God. When you take care of yourself you have a greater capacity to be of service and spread God’s message. 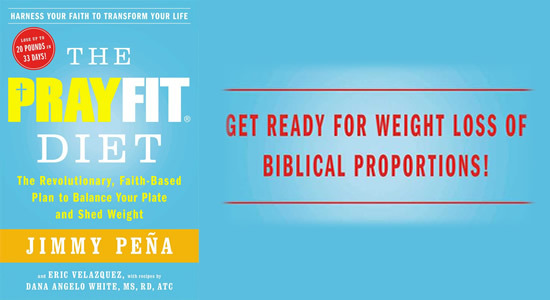 The PrayFit diet provides Biblical inspiration encouraging readers to become to embrace health as an act of worship. The PrayFit Diet: The Revolutionary, Faith-Based Plan to Balance Your Plate and Shed Weight retails at $16. Encourages consumption of a variety of whole foods. Does not require unusual or difficult-to-find ingredients. Incorporates a faith element, which will appeal to Christian dieters. Includes a 33-day meal plan with recipes and shopping lists. Diet plan is based on scientific research. Some individuals experience reduced energy on a low carbohydrate diet. Meal plan may not provide enough calories for physically active dieters. Could require a greater time investment for meal preparation. Will probably not appeal to non-Christian dieters. The PrayFit Diet uses a faith-based approach to weight loss that focuses on creating a life that is both spiritually and physically healthy. Christian readers are encouraged to pursue diet and fitness as a form of praise. However, the author maintains that the diet will work for all faiths.